Cowley College is offering Kansas High School students the opportunity to enroll in select college courses for only $49 per credit hour through the FastTrack Dual Enrollment Program. This exciting new program allows Kansas High School students to start earning college credit while still attending high school. Included in this special tuition rate, Cowley College will waive general fees and online course fees. Students can also take advantage of Cowley’s new textbook rental program and save up to 60 percent in textbook expenses. Cowley College was also recently selected as one of only 44 postsecondary institutions across 23 states, and the only college in Kansas and Oklahoma invited to participate in a pilot program that – for the first time – allows students taking college-credit courses to access Federal Pell Grants as early as high school. Janice Stover, associate vice president of academics and secondary partnerships, and Josh Cobble, executive director of enrollment management, along with Sarah Bryant, interim vice president for institutional advancement/director for marketing, and financial aid director Sally Palmer and her staff, were instrumental in creating the new FastTrack Dual Enrollment program. 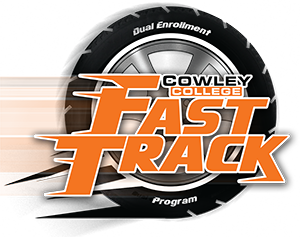 Those interested in the FastTrack Dual Enrollment Program or the High School: Pell ‘Dual Enrollment’ Program can talk to a high school counselor or a Cowley College Admissions Representative. For more information call 800-593-2222 or visit www.cowley.edu/dual.